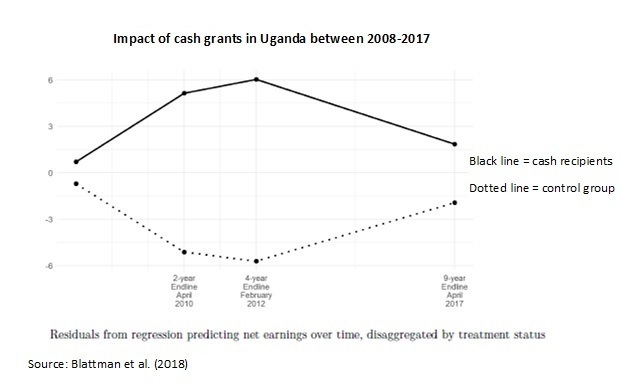 It was the bombshell of the week: the paper by Blattman, Fiala and Martinez on the “fading impacts of cash transfers over time” is out. The finding, which was mentioned casually in an interview back in March, ignited a flurry of related debates ever since (e.g., here). The basic story goes like this: in 2008, the evaluation’s treatment group included some 5,460 young-adults in Uganda (aged 16-35) receiving an average of $382/person to boost self-employment; 4 years later, the grants raised earnings by 38%, but after 9 years, these declined forming an inverted-U curve. At the same time, incomes among those not receiving grants increased, hence control and treatment groups converged in employment, earnings, and consumption levels. Cash grants had lasting impacts on assets, skilled work, and possibly child health, but had little eﬀect on mortality, fertility, health or education. See also Ozler’s nice blog dissecting the study and pointing out its numerous caveats. Short comment: the paper doesn’t imply “let’s do nothing because controls catch up”, but instead emphasizes what to provide and program interactions: “… what seems important is understanding the interactive eﬀects between grants and eﬀorts to relieve other constraints [and] it may make sense for governments to compare the costs and beneﬁts of enterprise capital grant programs to other temporary social insurance schemes” (p.41). And importantly, the authors don’t generalize the finding for other cash transfers: one-off-grants are very different from social pensions, CCTs and other programs in terms of goals, population profiles, design parameters, etc. From 9… even to 10! A paper by Barham et al found that, after 10 years from inception, conditional cash transfers in Nicaragua didn’t not lead to long-term impacts in learning, but did yield significant impacts on nutrition (body mass index), fertility, and subsequent labor market outcomes and income. But can cash transfers reduce violence? An global WBRO review by Buller et al shows that only 2 out of 22 studies find mixed or adverse impacts; the positive evidence was stronger for physical and sexual violence, and less conclusive for emotional or psychological violence. However, effects are insignificant for 2/3 of the 56 reviewed indicators (see also short blurb of the article). On a related issue, what do we know about on the effects of cash transfers on gender empowerment? A juicy collection of papers by CaLP explores the question in humanitarian contexts, including by stocktaking the evidence and presenting case studies from 4 African countries (Malawi, Niger, Kenya, Zimbabwe). A new paper by McIntosh and Zeitlin compared cash and in-kind transfers in Rwanda. The analysis benchmarks a cash-based program by GiveDirectly to the national Gikuriro scheme. The latter combines an integrated nutrition program with community health interventions, small livestock, fortified seeds, savings schemes, accompanying behavioral measures, and more. Among the interesting results, the in-kind package was 118% more effective at bolstering savings than cash, but it didn’t affect stunting (note: the timeframe for evaluation was short) nor maternal anemia. An equivalent amount of money led to small increases across many consumption outcomes, and signiﬁcantly increased the paydown of debt, as well as production and consumption assets. Interestingly, the model allows for precise estimates of trade-offs between objectives: for example, how much cash would it be required to exceed the impacts of the in-kind package? For savings this number is $694, and for stunting it is $277. A brief footnote on fact-checking: an accompanying NYT op-ed describing the above paper erroneously claimed that “… it is also the first time any funder has used cash as a tool to help determine which other programs work and which do not”. To my knowledge, the study is the 13th on the subject as it joins a dozen comparative evaluations (see here). A CGD note by Rose and Glassman promptly sets the record straight on global evidence (and offers thoughtful recommendations for USAID). Bonus on evidence and trials: the city of Chicago announced the creation of the Chicago Resilient Families Task Force. The initiative, which is supported by the Economic Security Project, will explore the viability of Universal Basic Income in the city, along with a modernization of the Earned Income Tax Credit program. Some handy one-pagers from IPC, including on social assistance in Saudi Arabia, Qatar and Mozambique – the latter has focus on harmonization as elaborated by Arruda in the full working paper. Switching to health, a new HE article by Shapira et al compared demand and supply-side incentives in Rwanda (h/t Dave Evans). One scheme rewarded community health worker cooperatives for the utilization of select services by their communities. The second scheme provided in‐kind transfers to users of such services. The analysis finds no impact of the cooperative performance payments on coverage of services, behaviors of community health workers, or outcomes at the cooperative level. Instead, the demand‐side intervention significantly increased antenatal care by 9.3 percentage points and postnatal care by 8.6 percentage points – even despite frequent stock outs. 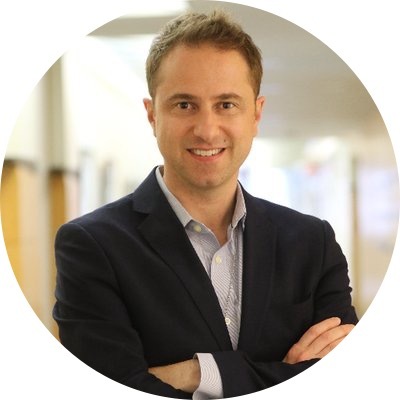 Speaking of health, bad health care is even worse than no health care (h/t Lawrence Haddad): a Lancet study by Kruk et al estimates that 5 million people die every year because of poor-quality health care in low- and middle-income countries. That’s significantly more than the 3.6 million people in those countries who die from not having access to care. (P.S. see short NPR piece here). Moving to political economy issues, a brilliant paper by Holland shows that Latin America’s poor are no more likely to favor redistribution (h/t Alice Evans). Why is this? A history of protracted limited coverage and barriers to social protection can lead to hopelessness about the benefits of redistribution. How real are the risks of automation on jobs and wages? A note by Chuah et al suggests that, in the long run, most technology-related fears are misplaced (h/t Michael Clemens). However, in the short and medium term, dislocation can be severe and require policies to facilitate labor market flexibility, strengthen social protection, and improve education and training. More on technology: hackers disabled security features of Aadhaar enrolment software, which was circulated hack on WhatsApp (h/t Saksham Khosla). A couple of curious resources. Roser built a nice geographical map recalibrated by population (the cartogram is made up of squares, each of which represents half a million people of a country’s population). Small countries with a high population density increase in size – see Bangladesh – while large countries with relatively small population shrink in size, e.g., Mongolia and Russia. As the US is, unfortunately, hit by hurricane Florence, an HR article by De Leon and McQuillin reveals a finding from past events: using the cancellation of a conference due to Hurricane Isaac as a quasi-experiment, the authors show that the probability of an article being cited increases by 5 percentage points within 4 years of being presented at the conference. Speaking of conferences, UNICEF, ILO and ODI are convening an International Conference on Universal Child Grants in Geneva, February 6-8, 2019 (h/t Ian Orton). The event, which is part of a wider project on the matter led by UNICEF and ODI, comes with a call for papers (deadline for submitting 500-word abstracts is Oct 1, 2018). Another announcement, this time on data: UNU-WIDER has been developing a new database, ‘Social Assistance, Politics and Institutions’ (SAPI). This provides a synthesis of longitudinal and harmonized data on social assistance programs in developing countries for 2000-2015, including information on program characteristics, country-level institutionalization, financing, and welfare impacts (h/t Miguel Niño-Zarazúa).